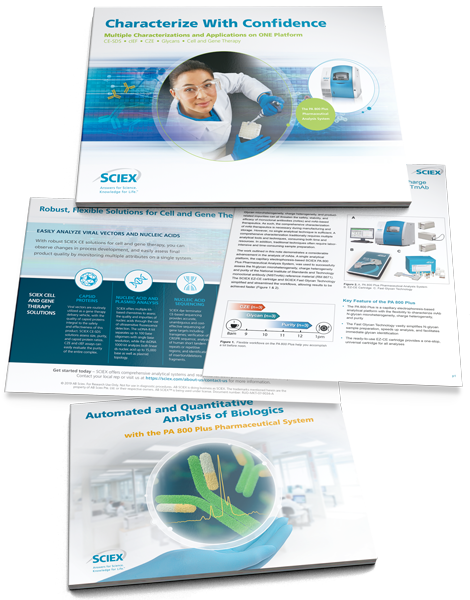 The PA 800 Plus system from SCIEX provides your laboratory flexibility when it comes to running multiple applications on one platform. SCIEX workflows let you to do more, quickly, allowing your lab to get the answers you need when you need them without taking up precious bench space. Download the info kit to see how core biopharmaceutical characterization applications, including purity, identity, charge heterogeneity and microheterogeneity, can be carried out on a single quantitative platform—with speed, sensitivity, and high-resolution.